This may just be my own idea, but I think many people have the impression that a bunch of guys make The Legend of Zelda games. The Animal Crossing1 games might give an impression as if a lot of women are involved, but The Legend of Zelda is a series in which a hero fights with a sword and shield. Actually, a lot of female staff members are involved with it, so today I would like to ask about how you invested this game with your own sensibilities and personalities. Thank you all for coming today. 1Animal Crossing: The first game in the Animal Crossing series was a simulation game released for the Nintendo 64 system in April 2001 in Japan. Subsequent instalments have appeared for the Nintendo GameCube system, Nintendo DS system and Wii console, with the latest instalment currently in development for the Nintendo 3DS system. Would you each please introduce yourself? 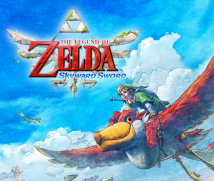 Which part of The Legend of Zelda: Skyward Sword did you work on? I worked on the dungeon in the latter half of the volcano, as well as the field design. 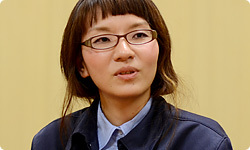 I’m Hirono, also from EAD. In addition to designing the characters that Link meets on his journey, I coordinated that team. Last time, I worked on The Legend of Zelda: Spirit Tracks, for which I designed characters. I’m Iwasaki from EAD. I coordinated work related to items and supervised design. I also worked a little on objects in Skyloft. There are a lot of items in The Legend of Zelda. Yes, a lot. It was hard even to grasp how many. I’ve helped out with past games in the Legend of Zelda series, but this was my first time to be fully involved. What kind of games had you worked on before? In the last few years, I’ve worked on games like Mario Kart Wii4 and Wii Sports Resort5. I mostly worked on animation for those. 4Mario Kart Wii: An action racing game released for the Wii console in April 2008. 5Wii Sports Resort: A sports game released in June 2009 in Japan as the first game making use of the Wii MotionPlus accessory. Players can enjoy playing 12 leisure sports. And this time, you did an entirely different kind of work. Yes. For the first time in a while, I made models. I’m Marunami from EAD. I coordinated things related to the objects. More specifically, I supervised design and arranged schedules, while also making content mostly focusing on objects in the forest and desert. You didn’t just coordinate, but also made objects yourself. 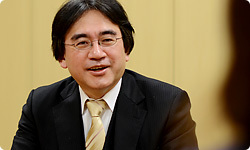 You were present for our fifth session of “Iwata Asks” about this game. Right. Well, since today I am talking to some of our female developers, the first thing I would like to ask is what impression you had of The Legend of Zelda the first time you experienced it, and once you became involved with working on it, how did your view of it change? 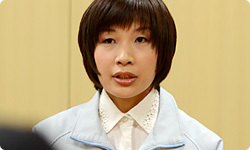 Hisada-san? Well, let’s see... I was never very good at 3D games. I had never played The Legend of Zelda, but when I joined the company, the team I joined was the team for The Legend of Zelda: Twilight Princess.6 In order to study The Legend of Zelda, I played The Legend of Zelda: Ocarina of Time.7 There’s that test of courage in the first dungeon inside the Deku Tree... 6The Legend of Zelda: Twilight Princess: An action-adventure game released for the Wii console and Nintendo GameCube system in December 2006. 7The Legend of Zelda: Ocarina of Time: An action-adventure game released for the Nintendo 64 system in November 1998 in Japan. Yes. You jump down from a high place toward a hole covered with a spider web. That’s right. I couldn’t do that. I said, “I can’t do it...” and put down the controller. The Legend of Zelda has its own unique logic. Does The Legend of Zelda seem different when you’re playing it than it does when you make it? It’s sort of like the difference between someone who goes to a haunted house for scares and someone who takes on the role of scaring people. Oh, yes. I didn’t think I was that type of person, though. After all, you didn’t have the courage to jump down from a high place. But once I got started, it turns out that I was! (laughs) I’ve built up a bunch of ideas now about what would be scary or would startle people. The first Legend of Zelda game that I played was The Legend of Zelda: The Wind Waker.8 8The Legend of Zelda: The Wind Waker: An action-adventure game released for the Nintendo GameCube system in December 2002 in Japan. Why did you play that game? Because it looked so cute! I thought, “I want to play that,” and bought it together with the Nintendo GameCube system. I’m the same as Marunami-san. The Legend of Zelda: The Wind Waker was my first Legend of Zelda game. Its visuals looked so new and the cuteness really attracted me. How was it once you actually played it? In contrast to the way it looked, it was quite challenging and felt incredibly real. That’s right. The visuals are cute, but there’s a realness to it, as if that world is really there. That’s why it was so immersive. I hadn’t played many video games, but it made me realise just how fun they can be! That’s right. I got totally absorbed in it. It’s only been nine years since The Legend of Zelda: The Wind Waker went on sale, but the two of you for whom it was the first Legend of Zelda game that you played are now making The Legend of Zelda games. (with feeling) That’s so true!